Affordable finds in hip 'hoods are (perhaps unsurprisingly) the focus of this week's Hot Dozen -- meaning more StreetEasy.com visitors clicked on these rental listings over the past seven days than any others. 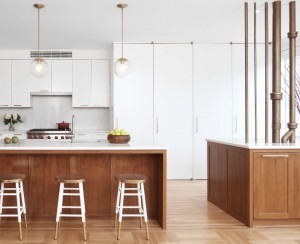 A studio at 55 Leroy Street and 7th Avenue passes the test for one-room living. Closet space? Check. Cooking-capable kitchen? Check. Full bath? Check. Windows? Check. The big draw, however, is the West Village/Hudson Square location. It sits on a tree-lined street next door to the superb Little Branch speakeasy; for quieter times, the ball fields and park on the water are just a few blocks away. 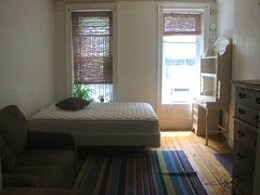 You just have to decide whether you can stomach paying $1,700 for a single room. Stroll up a few blocks to a $1,895/month walk-up (floor unspecified) at 111 Christopher St. and Bleecker; it's a one-bedroom if you count an arched doorway as a room splitter, a studio if you don't. But an arched doorway is pretty sweet, and so are the hardwood floors, big kitchen and oversized windows that let in a lot of light. Be prepared for a lot of loud twenty-somethings pouring out of the surrounding bars; it's probably best if you're one of them. Next, (and a lot further uptown) we have a $2,350 no-fee two bedroom at 104 W. 96th St. and Columbus Ave. 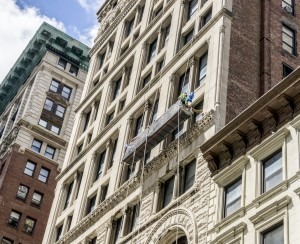 This true two-bedroom is only one block from Central Park and the B, C, 1, 2 and 3 trains. The full kitchen and bath, spacious living room/bedrooms and hardwood floors are all big draws. It's a lot of apartment for the money--perhaps because it's a fifth floor walk-up. 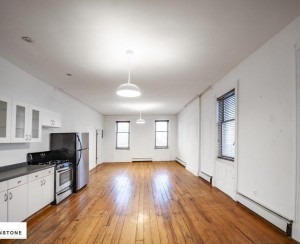 For more of the most popular rentals of the week--from studios to three-bedrooms and walk-ups to elevator buildings--consult the complete roundup below. For outside help, visit BrickUnderground’s Agent Referral Service, a free matchmaking tool that will set you up with the right guide to help you find the right place.